Your baby is the most important thing in your life, so leaving your child with a sitter, even for a few hours can be very hard. So after much coaxing you finally agree to take some time off, and yet you constantly feel as if you might be missing something before the sitter gets there. 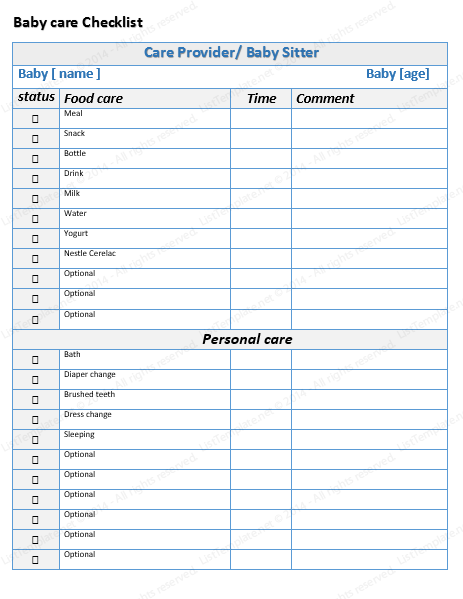 This handy baby task list for the sitter is the perfect checklist so you can be sure your child is taken care of. This is a clean and simple to do list template that allows you to make the changes you want to. You can easily print this checklist template from every computer or printer that you send it to. What makes it work is that you can assign a time table to it so your sitter will keep your child on the tasks that you set forth. When you are more comfortable with the sitter you can even expand the list, making changes where you need to by adding tasks for your child. Perhaps homework is something that you want the sitter to check on while they are watching your kids. Or you can add in a set amount of television time, or play time so everything is charted and the kids don’t take advantage of the sitter. Set in Microsoft Word® this to do list template is easy to edit so you can make the changes when you need to, anytime you need to. Always be sure that your kids are on schedule and behaving the way they do for you, or even better. Your care provider will thank you for the structure that you are giving them, and may even adapt the strategy for themselves.